We were delighted when artist Jonathan Mitchell donated an original oil painting of our President Sir Jackie Stewart racing at the 1969 German Grand Prix in the Matra MS80. The painting was commissioned in co-operation with Sir Jackie in order to raise funds and awareness for Dyslexia Scotland. The original painting was sold at auction at the Goodwood Revival Weekend in Chichester on 14 September 2013. This sale raised a phenomenal £5,000 for Dyslexia Scotland. 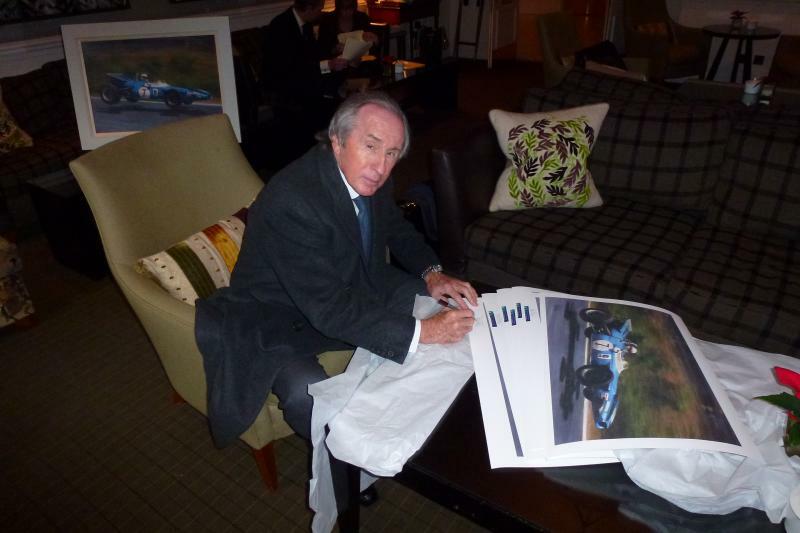 Limited edition autographed Sir Jackie Stewart prints are available to buy. Each print costs £250 (including mount). This amount comprises a payment of £150 for the actual print and a donation of £100 (suggested minimum) to Dyslexia Scotland - postage and packing is additional. If you are not a UK taxpayer you can click here to order directly from Canvas Art Gallery. Click here to see Sir Jackie signing the limited edition print and finally click here to hear what Jonathan has to say about the project and to view his other work.